Since multi-instrumentalist/composer John Zorn added three hundred new compositions to his Masada songbook in 2004, his label has released seven volumes of Masada Book Two with players including keyboardist Jamie Saft, pianist Sylvie Courvoisier, guitarist Marc Ribot and multi-instrumentalist Koby Israelite all rendering their own interpretations. Moloch, which translates to king, was a deity to whom ancient Middle Eastern worshipers sacrificed their first born. Thankfully, pianist Uri Caine’s album isn’t as brutal as one might suspect from something named for a god who is often depicted as a man with the head of a bull. Not to say that it isn’t forceful. At times it’s quite aerobic. Grumbling into a tenacious opening, Caine’s playing is direct and pointed on the first track “Rimmon,” and the energetic “Cassiel”. But it also yields to graceful flirtations like on “Lomiel,” where his left hand skirts gleefully around the heavy rhythm played on the lower keys. “Harshiel” is delicate as Caine plucks out a whimsical melody dusted with Sephardic implications. Not only does Caine have a foundation in classical music, he has released several albums where he improvises the work of a single composer. He’s tackled Mozart, Mahler, Beethoven and Bach, but never the French composer Erik Satie or Hungarian composer Bela Bartók, thoughts of whom arise as Caine scurries over the keys mingling Jewish folk fragments with classical hues. A founder of ethnomusicology, Bartók researched the music of regional ethnic groups and incorporated it into his own compositions. What Caine provides, missing from the music of Satie and Bartók, is the element of improvisation. On tracks like “Zophiel,” which begins with a gentle flow and traipses into festive jazz realms, Caine puts his signature straight through. 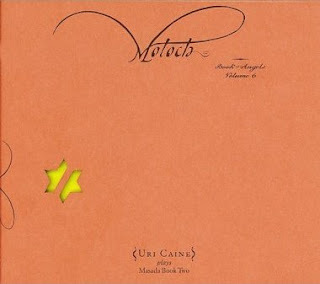 Moloch: Book of Angels Vol. 6 is an album that commemorates a diaspora, pledging devotion to a legacy rife with substance and belief, while presenting a vitalized palette of comfort and renewal.